But growing connections between haredi yeshiva students and national-religious towns in Judea and Samaria have some in haredi world worried. For more than a decade, haredi students from leading yeshivas have flocked to predominantly national-religious communities over the "Green Line", with Judea and Samaria becoming some of the most popular Shabbat destinations for young haredi men. While this phenomenon initially went unnoticed – and was later ignored – now for the first time haredi educators are speaking out publicly on the issue and expressing their concerns. 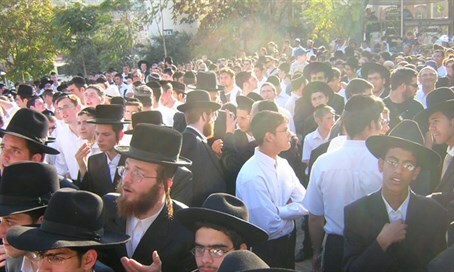 For residents of Yesha towns from Hevron in the south to Kfar Tapuah and Elon Moreh in the north, the presence of large groups of haredi yeshiva students on Shabbat is hardly a novelty. Despite the social and stark ideological differences, the trend has only increased in recent years, leading concerned rosh yeshivas to ponder what attracts so many to an area identified with violence and political turmoil. For some, the weekend trips to Judea and Samaria are simply a way to unwind in an unspoiled pastoral environment. G., a yeshiva student who frequently visits Judea and Samaria for Shabbatot told Kikar HaShabbat he was drawn by “the [beautiful] view and the wide-open green spaces”. Some yeshiva students, however, relish the opportunity to experience life in a non-haredi religious community and to interact – and often argue with – people with ideologies very different from their own. One official at a prominent haredi yeshiva acknowledged the phenomenon, noting that his students enjoyed spending time with people of different backgrounds – and debating with them, touching on everything from politics and ideology to theology. Hevron activist and perennial Knesset candidate Baruch Marzel, who was himself raised in the haredi community, welcomes large groups of guests into his home in the Tel Rumeida neighborhood every Shabbat. Marzel, a student of the late Rabbi Meir Kahane who maintains close ties with the haredi community, offers yeshiva students a familiar Shabbat atmosphere complete with the traditional Shabbat-day cholent, but at the same time an ideology far removed from mainstream haredi beliefs. Haredi educators, who have slowly come to acknowledge the growing trend, are divided over the issue. While some see such trips as harmless diversions, others have expressed opposition, citing safety issues and, most notably, the excessive exposure to views which strongly contradict those of haredi leaders.